SC are predominantly the structural cells and tissues that provide support for the plant . They include lignans, cellulose, hemicellulose, fibres from bark, branches and tough perennials. Fermentation in the hind gut (cecum and large intestine). Additional organs that have a part to play in the process are the pancreas and the liver. The hind gut is the the cecum, large colon and small colon. NOTE Anything that affects the horse’s ability to to metabolize its food correctly will affect its life span and health. For example, a horse with stomach ulcers or horses with teeth issues, poor gut flora, those horses with Equine metabolic issues, Insulin resistance. Cushings. the digestive tract should never be empty. Molars and premolars are for chewing hay or grain . Upper and lower incisors are for tearing the blades of grass from the base of the plant. To stimulate saliva production which is 99% water, the horse will chew 70-90 times per minute. Its role is to lubricate the food to help it move through the esophagus and to buffer the stomach. Saliva is also stimulated by the movement food on the mucous membrane of the inner cheeks as well as chewing and pulling grass A horse produces up to 40 litres of saliva a day. The esophagus is a 1.2 m muscle lined tube with a tough thick wall . The food moves through this tube by peristaltic contractions. The esophagus empties into the stomach. The non-glandular or squamous area where food enters from the esophagus. The glandular where it meets gastric juices for digestion. The stomach is relatively small approximately 10 to 12 litre capacity. Food passes through and out of the stomach in around 30 minutes. This is why feeding should be little and often. The non-glandular requires a pH of between 6-7 and this area of the stomach can be damaged when the pH is lowered by periods without food and/or diets without enough fiber. 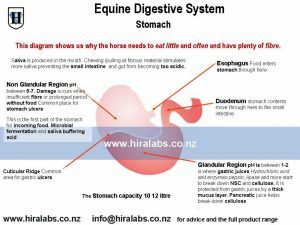 The non-glandular area has no mucus layer for protection from gastric juices so it is the most common place that stomach ulcers occur in the horse. Because horses are supposed to eat all the time they continually produce gastric juices so food must be present to be acted on. The glandular region has a much lower pH (~1-2) and lined with a mucus membrane so it is protected from the gastric juices needed for digestion. As more food is eaten, the food will remain in the stomach until it reaches about 2/3 capacity where it moves into the small intestine. Gastric juice contains : hydrochloric acid (HCl) and two enzymes, pepsin and gastric lipase. Proteins are digested in the stomach by pepsin. Gastric lipase helps start the digestion of fats into fatty acids and glycerol. There also is a secretion of pancreatic juice which help with the breakdown of cellulose . NOTE: These pancreatic juices also help the hindgut (cecum and colon) to maintain the microbiome. Hence the importance of fibre. The food now will enter the small intestine where the enzymatic digestion continues. The small intestine is approximately 20 meters long and narrow. The food moves through the intestines through various muscles . The small intestine digests starch, protein, fat, fat-soluble vitamins (A, D, and E), and many minerals either grazed or eaten. There are three sections of the small intestine. The duodenum is right after the stomach and where the food is mixed with the enzymes from the pancreas and the intestinal glands as well as bile from the liver. After the food is neutralized it passes to the jejunum where the nutrients are absorbed, and finally on to the ileum which just connects the small intestines to the large intestine part of the hindgut. 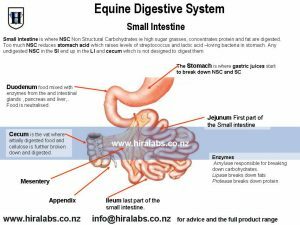 The food in the small intestine is pushed through with those muscular contractions at about 500mm/minute so it takes anywhere from 45 minutes to two hours for the food to pass through the small intestine depending on meal size, amount of forage and size of horse. Along the way there are specific enzymes from the glands in the stomach, the pancreas, and the liver that are meant to breakdown certain nutrients. Amylase is responsible for breaking down the starches in the diet into simple sugars. The starch (soluble carbohydrate) that is absorbed in the SI is either converted into glucose and used for energy or stored as glycogen to be used later. Too much stored glucose turns to fat and can cause metabolic issues. Protease breaks the protein into amino acids. Not all the protein in the food is digested in the SI though. The last section of the SI, the ileum, joins the SI to the hindgut. Any food that doesn’t get digested in the foregut ends up in the hindgut. The protein found in the cell wall of the plant (the fiber part of the diet) travels to the hindgut and is fermented. Cecum is the fementation vat for microbes that take 6.5 hours to act on cellulose and structural carbohydrates. Fermentation is a process where billions of naturally occurring bacteria and protozoa (together known as microbes) digest the fiber in a horse’s diet. Microbes have three functions; to produce energy through Volatile Fatty Acids, to synthesize B-vitamins and to synthesize amino acids (the building blocks of protein). Energy producing volatile fatty acids, amino acids, and B vitamins are produced in the cecum. Note: Colic is caused by food getting stuck in the folds of the cecum. That is why it is ESSENTIAL that the horse has sufficient chewing time to produce saliva as well as WATER ALWAYS AVAILABLE this is where most impaction colic occurs. The microbes in the hindgut adapt to the specific fibre your horse eats and eventually become a specific population for the type of food that your horse usually eats. 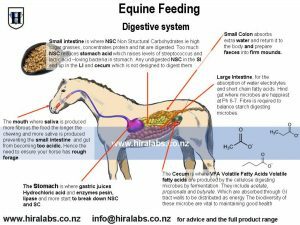 So what you feed your horse determines the gut flora. Changes in the diet must be gradual so the microbes can adjust. If you switch it too fast it can lead to too much fermentation which increases gas production and can lead to gas colic. Food in the stomach triggers the cecum to empty its contents of digesta into the large intestine (colon). The large colon extends from the cecum to the small colon and continues the process of microbial digestion through fermentation. The large colon is on average about 3meters long and holds approximately 15 to 60 litres of feed material and water. This is where absorption of water, electrolytes and short chain fatty acids (the main source of energy in the horse) occur. The pH in large colon should be around of about 6-7 for optimal microbiological activity. The right fibre digesting microbes start to die off causing the starch digesting microbes to increase. The dead microbes are released back into the bloodstream as a poison which causes laminitis. The food then passes as a liquid ‘soup’ into the small colon which is about a meter in length and holds 15 litres of digested feed and water. 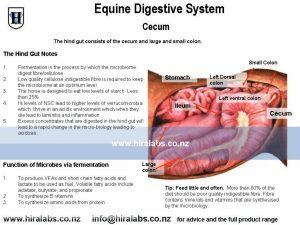 The main function of the small colon is to absorb any extra water and return it to your horse’s body. At this stage most the nutrients have been absorbed and the small colon prepares the waste material into small balls of faeces.